When a medical imaging device reaches what the manufacturer refers to as “end of life,” it certainly does not mean that your equipment is no longer able to perform the functions required to diagnose patients. Those devices aren’t dead – far from it. They’re still quite useful, and investing in a newer model may not be in your facility’s budget. End of life (EOL) simply means the OEM no longer sees it as having viability in the market and a new model is taking its place. For that reason, they end or limit support for the technology. You may get an unwelcome surprise when calling the manufacturer for help with repairs or a replacement part. That’s what happened to our friends at Baylor Scott & White Health (BSW Health), a highly-respected, not-for-profit healthcare system in Texas that’s one of the largest of its kind in the United States. Lead Field Service Engineer David Kalmikoff and Imaging Support Manager Steve Yates were disappointed when they called Siemens to order a Rotating Anode Control 75, which they identified as a part that had failed. According to Siemens, the system had reached EOL and it was no longer providing support. Siemens would not come to repair the system and they did not have a replacement Rotating Anode Control 75 available to order. Jeff Rindfleish, VP of Operations at Technical Prospects, explains that this part is used on equipment in angiograph rooms. The impact of device downtime and the cost to completely replace the system would be significant. Thankfully, imaging engineers at BSW Health knew who they could call. Kalmikoff reached out to Technical Prospects when the OEM was unable or unwilling to come through. “That particular part controls the speed of the anode on the x-ray tube, and it’s a fairly common failure, so we make sure to have it in our system,” says Rindfleisch. And that’s a good thing, because a few days later, the exact same part failed in another angiograph room at BSW Health. Without those Siemens medical imaging replacement parts, there could have been a significant price to pay in the form of patient disruptions and possibly even a costly upgrade. If there was a new Rotating Anode Control 75 available, the list price for the part would be more than $15,000. Rindfleisch says he estimates that BSW Health would likely have saved around 80% by ordering from Technical Prospects. They also experienced savings by avoiding downtime in their angiograph rooms. 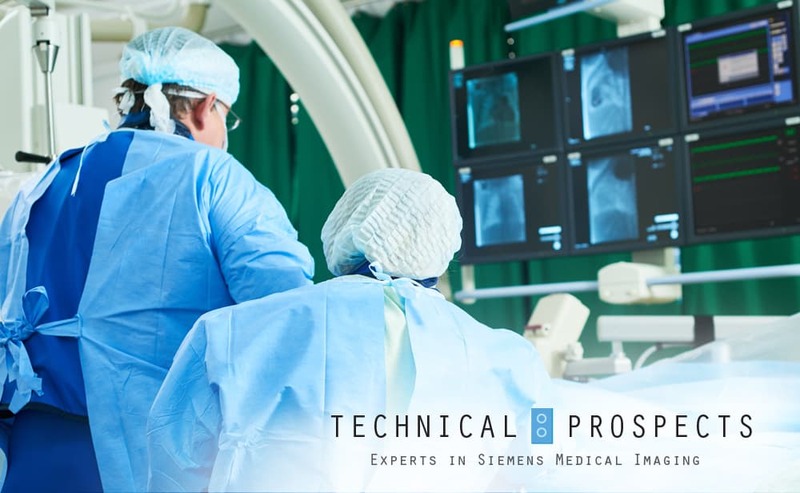 There are many ways Technical Prospects strives to serve healthcare facilities with Siemens medical imaging equipment needs. In addition to our free support, helpful video library, and comprehensive hands-on training, we’re also hard at work behind the scenes assuring things run smoothly for our customers. For example, our robust inventory management system helps us keep track of more than 40,000 different new and refurbished replacement parts. Every part has an individual lot number, and our system tells us where and when we acquired it, how long it’s been inventory, and the sales velocity of the part, or how quickly it tends to move out of inventory and into the field. “When we notice we’re running short, we acquire another system from which we can harvest those parts so we are able to continue meeting the needs of our customers,” Rindfleisch explains. For angiograph systems, Technical Prospects offers replacement parts on Siemens Artis Zee as well as its predecessors such as the Artis zeego and even older devices. Rindfleisch is confident that the expansive inventory and team of experts are a winning combination that supports your imaging engineers’ efforts to keep devices running. “If you want to extend the life of your Siemens medical imaging systems, partnering with Technical Prospects is a wise decision,” he says. The next time your Siemens medical imaging systems require a replacement part or you need help troubleshooting a problem, give us a call at 877-604-6583.